Several weeks ago I read an article claiming Gravity as the first Best Picture lock of the Academy Awards season. The article lauded the film’s realistic handling of an historically campy genre (sci-fi), the two stars (Sandra Bullock and George Clooney), and the film’s “bar-raising visuals.” This praise, especially that for the visuals, was echoed elsewhere. NPR proclaimed, “doctoral thesis will be penned on the breath-catchingly realistic, gorgeous [cinematography]” and The New York Times said, flat out, “you have to see it to believe it.” As someone who went to Space Camp as a kid and spent hours recreating Apollo 13 in a pillow-fort-lunar-module (and as someone who’s been let down by Hollywood’s endeavors into outer space over the past decade), I was thrilled at the possibility of a new addition to the space film canon. And I can say, without question, that the cinematography is jaw-dropping. The opening scene — in which a tiny speck of a space shuttle glides slowly (almost harmlessly) into the foreground, allowing the camera to maneuver and zoom, more first-person than third, towards the two protagonists out on a routine spacewalk — lasts an incredible 13 minutes without a cut. The director, Alfonso Cuarón, and his team spent years inventing new camera and lighting techniques to achieve such immersive, extended takes and the result is a depiction of zero gravity that is among the most thorough and intimate ever committed to film. Unfortunately, groundbreaking cinematography is about all Gravity has going for it. Once you get past the slick camera work, the film is, at heart, little more than a thriller with clunky dialogue, cliche-ridden characters, and trite symbolism. Leaving the theater, I was wholly disappointed that such a promising movie could be brought down by such a redeemable screenplay. However, one of the movie’s flaws seemed to bother me more than the others — its inattention to geography. Though the movie is relatively brief and fast-paced, the characters take frequent breaks from dodging space debris to marvel at the beauty of Earth as seen from space. George Clooney’s character, in particular, repeatedly offers cocksure assessments of the Earth’s grandeur, though anytime the camera pans Earthward to show us what he’s talking about, we’re left gazing at an ambiguous medley of generic landforms and vague bodies of water. Few and far between are the shots of easily recognizable geomorphology. We clearly see the Nile River Valley at one point (“the cradle of civilization” — again, trite symbolism) and there’s a shot of Italy’s famous boot shape in there, but I had trouble identifying anything else. It got so distracting that I quit following the action at times in hopes of spotting a familiar coastline in the background. I even saw the movie a second time, thinking maybe I’d missed something, but the second viewing left me even more perplexed — I mean, it looked like Earth (blue, green, occasionally cloudy) but where were all the familiar shapes? 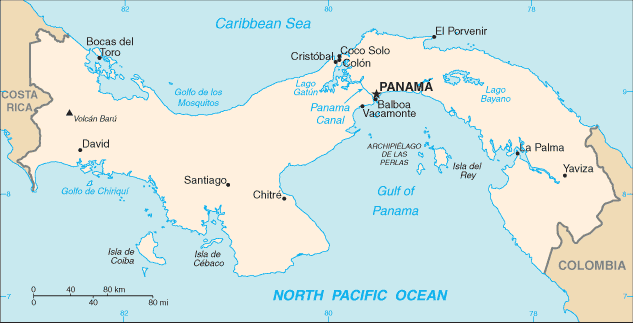 This isthmus appears to resemble the Isthmus of Panama though, compared to a map, the similarity is rough at best. I recommend comparing these clips to actual footage of the Earth taken by orbiting space craft (for example, this post). In the real footage, there’s no shortage of recognizable geography. It’s like running your finger across a globe — there’s the excitement of spotting Chicago, Detroit, Atlanta (etc.) and the existential awe of how small we all are. This same wonder is largely absent from Gravity because, despite the mind-blowing cinematography, the Earth they choose to show us, lurking in the background of every shot, providing both the literal and narrative gravity, just isn’t ours.